The following contains some duplicate information from my most recent post, but I promised my mom that I would pinch hit for her Saturday Pantry Lifestyle post, as many of her readers wanted more details about micro session freezer cooking. So I’ll start from the beginning! Just recently, my weekly meal preparation routine was revolutionized. Determining that I wasn’t going to waste the many downloads on my computer from the Ultimate Homemaking eBook Bundle, I sat down with a few spare moments toward the end of the summer to peruse a chapter or two of Crystal Paine’s ebook on Freezer Cooking. Right off the bat, I was inspired with a number of practical ideas that I could immediately incorporate into my own rhythm of meal preparation, but what stood out the most was the idea of “micro sessions” of freezer cooking. Knowing that I’ll never be a once-a-month freezer cooking kind of gal (I just love the daily rhythm of the dinnertime hour, the chopping and the stirring, the bubbling pot and the aroma of dinner as it simmers or roasts), I thought that I was left to “cooking from scratch” for each. and. every. meal. Sure, I had a baggie or two of cooked chicken or ground beef floating around in my freezer. And “floating” they were, lost amidst the frozen vegetables and unmarked tupperware containers of mystery leftovers. But a system of every possible fresh ingredient that could be prepped and then frozen for the meals I most regularly fix was certainly not something I’d thought of doing before! But once I got started, the micro sessions quickly snowballed into a well-stocked freezer of ready-to-go meal ingredients, and my dinnertime prep became nearly effortless. Flash Freezing: This might sound fancy, but flash freezing is simply freezing separate pieces of food for a short time so that they harden enough to freeze all together without sticking or clumping. For instance, if you spread berries out on a cookie sheet in your freezer and freeze for two hours, you can then bag them in a freezer bag and they should separate easily for you when you go to use them. Clear Labeling: One of the biggest mistakes I made in the past when placing food in my freezer was not labeling it clearly. I now find freezer bags more convenient to use over tupperware or other containers because they are so easy to write on. Labeling the bag with the quantity (pound, cup, batch) and what meal it’s intended for is extremely helpful. A date is helpful as well, so that you don’t keep pulling out the freshest bags of diced chicken breast and leaving behind one you bagged four months ago. Identify the Meals: The true key to success with this style of freezer cooking is to narrow down your core list of meals, the ones you use in regular rotation whether you plan your meals out on a calendar or not. For me, that meant making a list of twelve moderately healthy and economical meals that are generally liked by my family. I then listed out any perishable ingredients that could be prepped ahead and frozen. Another trick is to make sure you buy enough of a particular grocery item to make your micro session a profitable use of your time, which for me was a bit of a learning curve. As I said, the idea of grilling extra chicken or browning extra beef is not new. What’s new is the idea that I do so, separate the cooked and seasoned meat into appropriate amounts, and freeze in a plastic bag (or preferred container) clearly labeled for the intended meal and stored in the freezer with or near the meal’s other ingredients, if applicable. For instance, I have 1 lb of cooked and crumbled bacon packed up and frozen next to leeks sautéed in olive oil and salt, a pint of heavy cream (yes it can be frozen, but only for recipes, it will not whip up after defrosting), two pie crusts and sprigs of fresh thyme. The day I plan to make Bacon, Brie & Leek Quiche, I take out these ingredients and just simply add eggs and cubed brie…dinner comes together literally in a few minutes and soon those luscious quiches will fill the house with a tantalizing aroma as they bake in the oven. How about Tuscan Soup? That’s a recipe where I use both ingredients from my pantry and the freezer. So one day, when I have about 20 minutes to spare, I might take three or four packages of Italian Style chicken sausage, slice it all up on a diagonal (to make it fancier, don’t you know), and sauté all of it in one big pan. Separate into one pound portions, bag it up, label and freeze. On another day I will wash a few bundles of kale, tear it into bite size pieces, and sauté in batches with olive oil, garlic and salt. The kale does especially well in this recipe after defrosting, because it’s going into a soup. Come dinner time, when Tuscan Soup is on the menu, out comes the box of chicken broth, 2 cans of diced tomatoes, the sausage and kale (straight from the freezer if you like! ), two cans of rinsed cannellini beans, and a package of dry cheese tortellini (added 20 minutes before serving). If you like to add herbs or diced onion to such a recipe, just freeze them right in with the kale. What about Chef Salad? That’s all produce, right? All that rinsing and chopping? But if I have diced grilled chicken, cooked and crumbled bacon, crumbled hard boiled egg yolks, pecans, craisins, chopped deli ham, herbed croutons, and crumbled bleu cheese all portioned out and frozen together, all I have to do is defrost them and arrange them neatly over a package of salad greens. Add some rinsed grape tomatoes, chop a cucumber and drizzle on some salad dressing and you just pulled together a fresh, nutrient-dense entree salad in a few minutes flat! For Chili, Tacos, and Pasta with Meat Sauce, all I need is the one or two pounds of ground beef cooked and labeled. I was seasoning my taco meat before I froze it, but then I realized I need to reheat the meat anyway, and my taco seasoning is at hand right near the stove, so now I eliminate that extra step. For Tacos, you can even portion out your shredded cheese and yes, even the sour cream and freeze all of it together. Sour cream will alter in texture slightly after spending time in the freezer, and it also has a pretty good shelf life in the refrigerator, as does cheese, so I freeze only the meat. This would be more traditional freezer cooking as we know it, but don’t be deceived, it can still fit into a micro session of freezer cooking! For example, if you have several pounds of fresh (not previously frozen) ground beef on hand, think how quickly you could whip up four or five meatloaves? Take an extra large mixing bowl, grab some eggs, breadcrumbs, milk and seasonings and within minutes you could have foil-lined loaf pans filled with a future main course! Flash freeze and then wrap up tightly in parchment paper and an outer layer of foil. 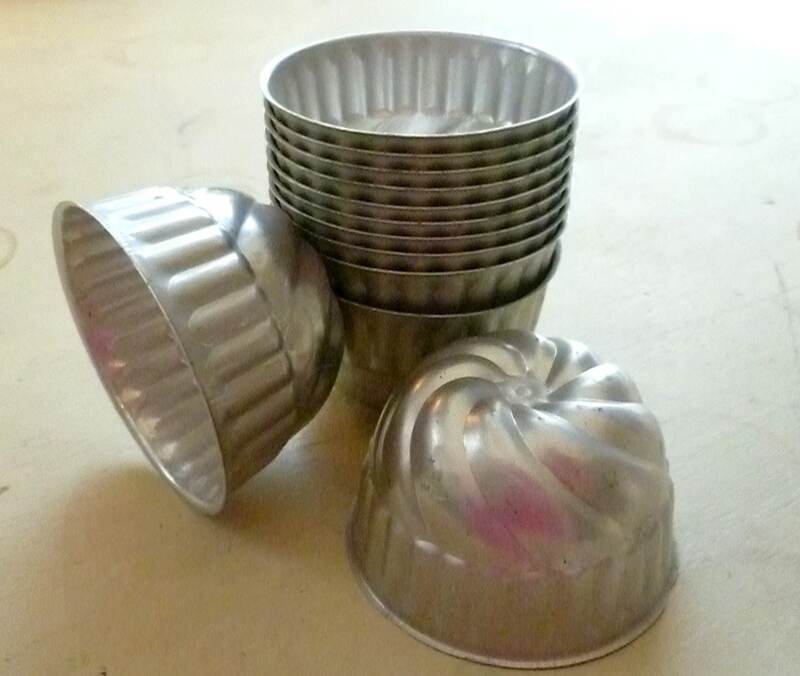 You can also do this with mini-meatloaves in standard or jumbo muffin tins, but the flash freezing might be a little trickier, requiring plentiful greasing or sturdy foil baking cups. Also consider prepping a crockpot meal or roast in this fashion. Again, beginning with fresh meat, you can get all the prep stages of rinsing, stuffing and seasoning out of the way and then freeze the chicken or roast in a freezer bag complete with oil, butter, or sauce. Allow an hour or so on the counter or overnight in the fridge for defrosting before loading your crockpot, or fully defrost for an oven roast. This takes the headache out of a citrus chicken, an herbed pork roast, or a garlic and pepper beef roast with onions and carrots. Freeze fresh chicken breasts in a bag with a jar of marinade and the meat will absorb the flavor as it both freezes and defrosts. Having your main course essentially done ahead leaves you more time for preparing side dishes, making this method a perfect fit for entertaining or for the end of a busy day out of the house. How is this different than “Make-a-Mix”, you ask? Well…not that much, really, but it does open up some new possibilities. For one, I don’t care to mix salt and baking soda up with other ingredients and then store them at room temperature. I think it takes some of the “POW!” out of the chemical reaction when wet ingredients are introduced. However…mix up six batches of cornbread by measuring the ingredients into propped-open freezer bags, label the outside of the bags with the required wet ingredients (milk, eggs and oil), and then freeze, and Chili Night seems that much more effortless because I served up a basket of piping-hot corn muffins, whipped up in minutes flat and baked on a convection setting for a mere 10 minutes. Let’s take it a step further…how about Blueberry Muffins or Apple Cinnamon Bread? Or any muffin or sweet bread for that matter. Mix up your dry ingredients, down to citrus zest or chocolate chips. Flash freeze your berries on a cookie sheet and bag them up. Sauté those apples in a little butter, sugar and cinnamon. Does your recipe use sour cream, cream cheese or heavy cream? You can freeze those right alongside, if you think the expiration date might roll around on the calendar before your next baking day does. You can also freeze a basic muffin or cupcake base in a baggie and keep your add-ins flexible, choosing berries or raisins or chocolate chips as inspiration directs! Store all these (the base baking mix, dairy, and add-ins) in separate bags near one another in the freezer or grouped together in a larger freezer bag. I recently saw an idea on Pinterest for freezing your pancake batter in large cake decorating bags, the 16 inch disposable plastic kind. FIll the bag, and secure at the top with a Twixit Clip. Defrost in the fridge overnight and when your griddle is sizzling hot, just clip the bottom of the bag and squeeze out perfect circles of batter! (I would recommend moving the twixit clip up an inch before defrosting to allow for bubbling and expansion!). The sky is the limit with baked goods. Bread products freeze beautifully, whether in batter form or already baked. So if you have room, fill that freezer up with little loaves of quick bread, homemade pancake mix (dry mix or batter), dinner rolls, or cookies all mixed up and scooped out on parchment, then flash frozen into individual balls for an after school snack of cookies and milk. You can flash freeze cinnamon rolls before they are cut and pressed down. You can freeze individual homemade crescent rolls and bake up two or two dozen on a whim, simply by flash freezing first and then popping into a freezer bag. Homemade pie crusts, pizza dough and mini pizzas work the same way. All can be made in large batches with spare time in the kitchen and later yield savings of both time and energy when the time rolls around to get dinner on the table! 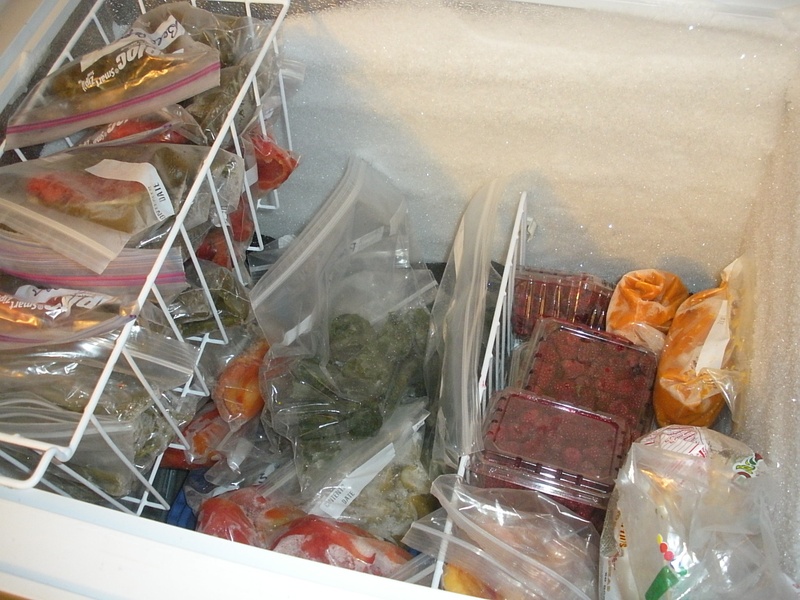 I also use the freezer to help me save money on perishable ingredients that I use in my regular meal rotation. For instance, I realized I only need a jar and a half of sauce each time I make Chicken Tikka Masala for my family. In the past, I would simply use two and have a rather unsuable portion of leftovers (having not added extra chicken) and the extra sauce was virtually wasted. Now, I take the half jar and pop it right in the freezer, as is! Next time I make that meal, I not only pull two pounds of cubed, cooked chicken out of the freezer (clearly labeled for Tikka Masala, of course), but I also pull out the half-full jar of sauce. They are stored near one another in the freezer. I use this same method for jars of tomato sauce, packages of bread products, tortillas, etc. Once I realized my family only needed half of a long Artisan Baguette to compliment a pasta meal, I bought a few of them and froze them, sliced in half on a pretty diagonal, in gallon size freezer bags. Tortillas come in packages of 8 but we consistently use 10? That’s right! Purchase 5 packages, rip open and divide into four freezer bags, clearly labeled for Taco meals, and the item needn’t appear on my grocery list for at least a month if not two! I like to warm my breads and tortillas in the oven before serving, slicing up the bread or piling rolls up into a pretty basket lined with a colorful cloth napkin. And so, one can achieve the ease and time-saving benefits of freezer cooking without the grueling all-day cooking session. And I’ve cut my grocery budget by around 30%! Keep checking back, I plan to post many of my recipes in detail, with notes about what is stored in the pantry and freezer. Thank you, just what I wanted! I’ve never felt anything but overwhelmed when I’ve read about the shopping/preparing/cooking involved in planning meals for a month, but I really like the idea of this. And thank you for taking the time to write all this out – I know you are a busy, homeschooling mom and that this will have required you to be generous with your time – for the benefit of readers. Yes, this sounds doable. Thanks for added tips! You have broken this (often overwhelming) task down beautifully! As an old hand at working ahead of need I am totally inspired to by the fresh ideas you’ve shared…the chef salad toppings and sautéed kale to name just a few! Thanks so much for taking the time and trouble to post this for us! I’m here from your mom’s blog, and WOW, am I glad I hopped over here! I’ll definitely be making use of many of these tips! I’ve always felt tired when even THINKING about doing once-a-month freezer cooking, so I knew I’d never actually try it. And while I do try to double up on some meals as I make them, to freeze one for a future dinner, it doesn’t happen as often as I’d like. But micro-freezing…this, I can do! And it just might help me with my goal to be more at-the-ready to take a meal to those who are ill or going through a rough time in the coming months. I find I often hear of someone in need who would appreciate a home-cooked meal that very evening, but there’s just no practical way to buy the groceries, put the meal together, and deliver it by dinner time (while homeschooling my children and running a household), and so my good intentions go unfulfilled. But if I could come up with some ingredients to prepare ahead of time for such meals, I’d be much more likely to follow through and actually bless someone! Sorry…didn’t mean to type two paragraphs here! But thank you again for these very useful tips! It has helped me with just exactly that! Since starting just about six weeks ago, I have delivered FOUR meals to families in need of a last minute meal! I was never able to participate in blessing someone with such short notice before micro freezing!! This year I began using Avery address labels for my freezer bags. I have just enough room to write the date, the contents and any special cooking instructions (temperature, time, freezer to oven, or thaw and heat,etc.). For a few days consumed in loss and taint ? Another example of deep, meaningful, and often forgotten old hymns set to contemporary, soulful music. A few new compositions thrown in for fun, but always in keeping with timeless gospel themes of repentance and redemption. When I'm not listening to Indelible Grace, you will probably find me shuffling on my playlist to a Red Mountain church tune! 17. Resolved, that I will live so, as I shall wish I had done when I come to die.